Almost everyone nowadays is aware of the fact that the rise of smart technology has also risen the multi layer approach of security to the information world. Each day, the online world is corrupted by multiple threats, virus, malware and pretty much everything that can compromise a user’s privacy and protection. However, counter tackles like Online Protections, Standard Antivirus software, and the old-school Firewalls are already present for the devices, but they are not enough. Another important aspect to remember about these software is that when you implement these type of monitoring securities, people often overburden the system and misconfigure the tools. Fortunately, VoodooShield is the program to satisfy all your needs right now. So, without any further ado, let’s go through the review of this remarkable tool that automatically locks your computer for security and protection purposes when you’re away. Though, Windows has pretty much every solution at their disposal. Apart from the typical Antivirus software, software like Sandbox and Anti-Exploit software are present to run the apps under protected settings and environment, but they are not feasible for an average user. 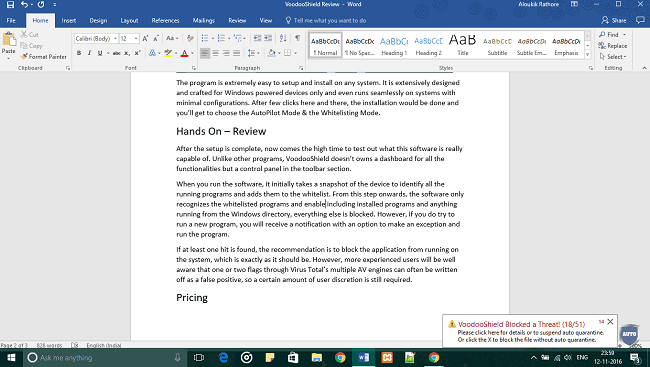 Another software is Anti-Exe programs that only allow the white listed software to run efficiently on the device. Moreover, other non-wanted scripts, adware, and useless programs are blocked automatically by such software. But why would you need a tool like this? The first thing that hits is that occurrence of such software for your computer. 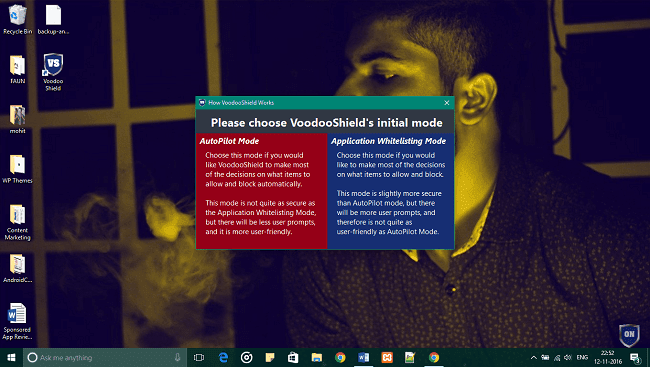 Moreover, if you’re already using an Antivirus, then why opt the VoodooShield tool for security purposes. That’s why the review is here. You’ll get the benefits as you read over. To get started with VoodooShield, all you need is to download and install the software on your device. Though it is a premium tool with so many incredible features, the company still offers a trial version for all the users to try out the fantastic Block Protection, Machine Learning AI, and other smart modules integrated within the tool. You can download VoodooShield's free version directly from its official website. All the necessary information and its incredible features are mentioned on the website below. The program is incredibly easy to setup and install on any system. It is extensively designed and crafted for Windows-powered devices only and even runs seamlessly on systems with minimal configurations. After few clicks here and there, the installation would be done and you’ll get to choose the Auto Pilot Mode & the White listing Mode. After the setup is complete, now comes the high time to test out what this software is accomplished by unlike other programs, VoodooShield doesn’t own a dashboard for all the functionalities but a control panel in the toolbar section. When you run the software, it initially takes a snapshot of the device to identify all the running programs and adds them to the whitelist. After this step, the software probably recognizes only the whitelisted programs and automatically blocks all other apps. So, if you’ve turned ON the protection, then the VoodooShield takes over the security management of your device. Here's a video based on 1,000 malware sample pre-execution efficacy test. Denies access to unknown users even in Offline Mode. The database is updated daily for upcoming Viruses, Threats, etc. Free Non-Commercial Version for New Users. Training mode, where you can also test the malicious code without changing any situation of the software. Existing Malware could be easily White listed. Requires More Features as a Pro Tool. The Software also has the option to manage and alter the added software from the Whitelist Editor. You can quickly update the Whitelisted Software online or reset the list. Moreover, VoodooShield is also entitled to update the database and then looks out for any anonymous or unknown threat or security. Another important feature of the tool is the Blocklist Option. So, if at least one hit is found during the snapshot process, the software pops up to aware the user about the tool. It also recommends the user to block the application from running on the computer. Let’s admit it; the free version never satisfies the user fully and also lags some of the best features offered by the tool or software. The Pro version offers the user to change all the advanced settings, adding directories, editing the whitelist and much more within the tool. So how much does this software costs? 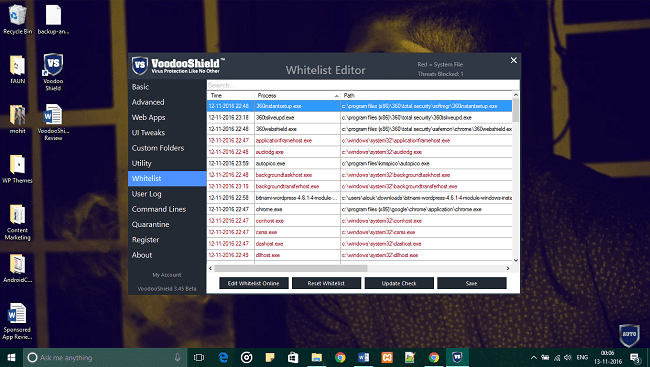 The VoodooShield Pro version’s license is available for $19.99 and brings out some of the most extensive features by the tool. It is billed for an annual period, and you’ll receive free updates through the developers. All in All, an affordable deal for the users to get the most out of this remarkable piece of smart technology. You can get more information here. Do let me know of what you about this tool. VoodooSoft's VoodooShield is a handy tool and often useful for all the corporate people working on similar network or workstations. Just lock the PC with this software and no other unwanted program would run on your device. Comment below if you like it. Cheers!